I went to Loara Elementary, Ball Junior High, and Loara High schools. And they were all great. I was in theater and choir. I was in cheerleading and on the drill team. I did speech contests. I was the sports editor of the yearbook in high school and the senior class president. All of this makes it sound like I was so successful! But I remember plenty of things I was not a part of. Not making a cheerleading squad that I very much wanted to be a part of. But somehow I would bounce back and try again at something else. 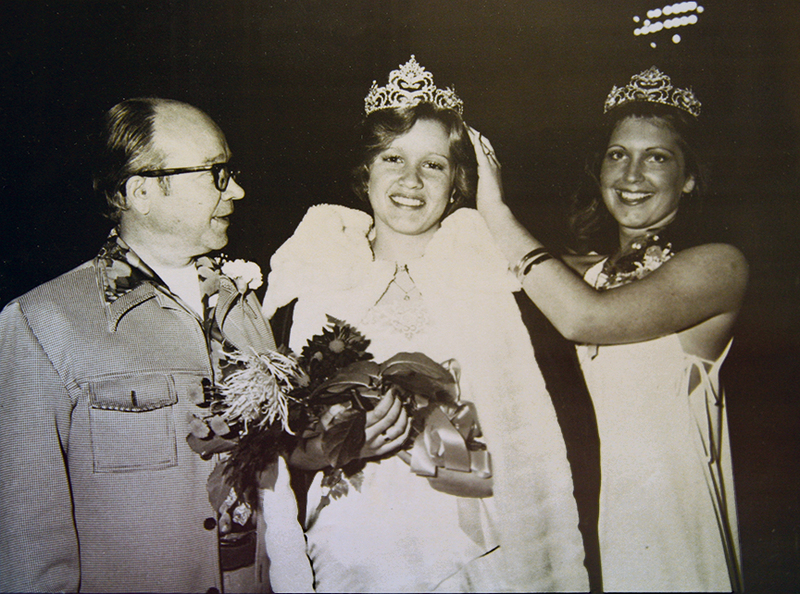 And, yes, I was homecoming queen. I think that may have happened because I was in so many different groups at school. We were driven around the football field in cars, and I was being silly and waving and thinking that it was all a lark—that I wouldn’t actually be the homecoming queen. I was shocked when they called my name. I still have that crown. Can you imagine? But here’s an even funnier thing: Since I was senior class president, I actually selected that crown for whoever would win. Our fathers escorted us onto the football field that night. Wasn’t that a good idea? So that’s my dad looking so sweet, and so swell. Is that a leisure suit he’s wearing? It’s certainly a snazzy shirt, isn’t it?